There are many secrets buried beneath London’s streets. Once classified, but no longer, is the underground complex beneath the Government Offices Great George Street (GOGGS) near Whitehall, in Westminster: the Second World War Cabinet War Rooms. These will forever be associated with Britain’s wartime Prime Minister, Winston Churchill (1874-1965); thus, including a remarkable Churchill Museum, the complex is now often known as Churchill’s War Rooms. Here, during the dark days of World War Two, while the Blitz raged overhead, Britain’s war effort could be planned and coordinated. Never one to avoid a tempting cliché, you can almost smell the cigar smoke. London’s Cabinet War Rooms became fully operational just a week before war was declared on 3rd September 1939. At least one other secret underground government complex was constructed during 1939 in the London area, code-name Paddock, at Dollis Hill, NW2. This was specifically designed as a back-up to the Whitehall operation and parts of it are still there, underneath a housing estate. Both facilities were created on a strictly need-to-know basis. 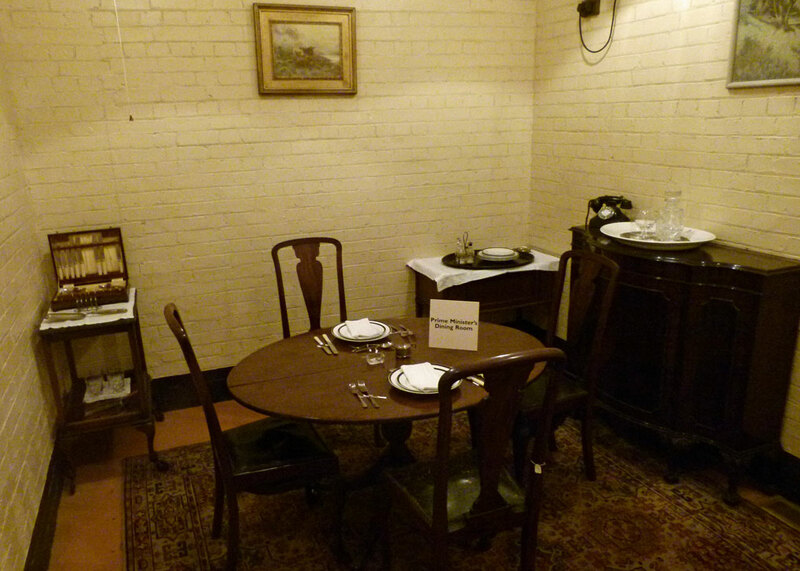 However, the GOGGS Cabinet War Rooms was not a specially constructed shelter. 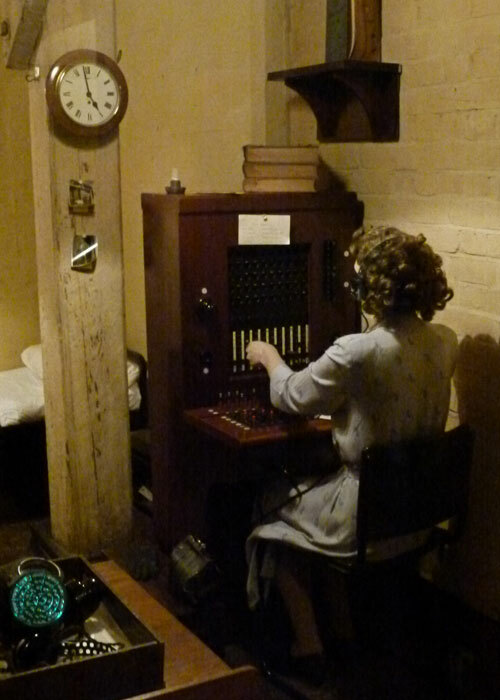 Compared with a Cold War era purpose-built air-conditioned fully-serviced subterranean sanctuary, designed to withstand attack and ensure survival, where a government could function until safe to emerge into the smouldering ruins and pick up the human story, the Cabinet War Rooms facility was extremely primitive. Unlike Hitler’s specially constructed bunker, 8 metres below Berlin and protected by 3-4 metres of reinforced concrete above, the British Government’s underground nerve-centre was cobbled together from existing basement storage rooms, chosen for the calculated strength of the building above and the central location at the heart of Whitehall. Close to the Prime Minister’s residence at 10 Downing Street and the House of Commons, they were just 12 feet below office workers innocently going about their business at street level. Furnishings were stealthily diverted from other places to avoid suspicion that anything was going on. The whole thing smacks a little of ‘make do and mend’; it shouldn’t have worked, but it did. Later, a slab of concrete, between 1 and 3 metres thick, was ingeniously inserted between the ceiling and ground floor above, using American-supplied pumps. The Slab was extended, allowing the complex to occupy a larger area. 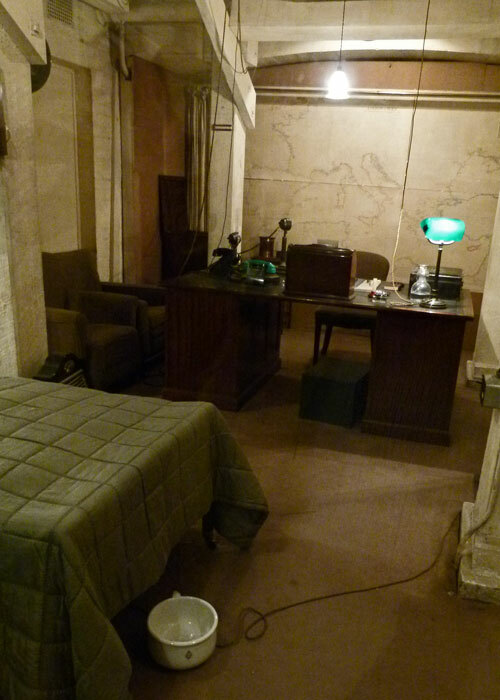 Despite the concrete, though, the Cabinet War Rooms were never bomb-proof and were also by no means immune from other risks – like poison gas, flooding or, of course, penetration by the enemy. However, they remained safe and sound; and it seems that the Nazis somehow never cottoned onto this particular British secret. After the fall of France, one of Churchill’s greatest achievements, if not the greatest, was to continue the war – there were many who would not have – and to inspire others to do so. In that darkest hour, Churchill recognised that Britain and the Commonwealth were unlikely to be able to win without help, but could do enough not to be beaten. He knew that, in time, the USA would recognise that Hitler and his regime had to be eliminated. He also knew that, eventually, mainland Europe would need to be invaded and set free. And, somehow, this spirit of resistance, of planning some great crusade against evil with inadequate resources, seeps from the drab, painted, inadequate concrete walls of the Cabinet War Rooms. Churchill’s Assistant Private Secretary, John Colville, said: “Immediately Churchill became Prime Minister the pace in Whitehall changed: people started to think faster and to act fast. Distinguished civil servants could be seen running down the passages…” The man’s pace of work was legendary; he is reputed to have regularly worked 19-hour days; and he expected others to do the same. Churchill actually disliked his underground lair and only used it when he had to. Nevertheless, this place bore witness to discussions and decisions about great events, through the Battle of Britain and the Blitz, to the Nazi invasion of the Soviet Union, the Japanese attack on Pearl Harbor, triumph at El Alamein and, gradually but inexorably, final victory. 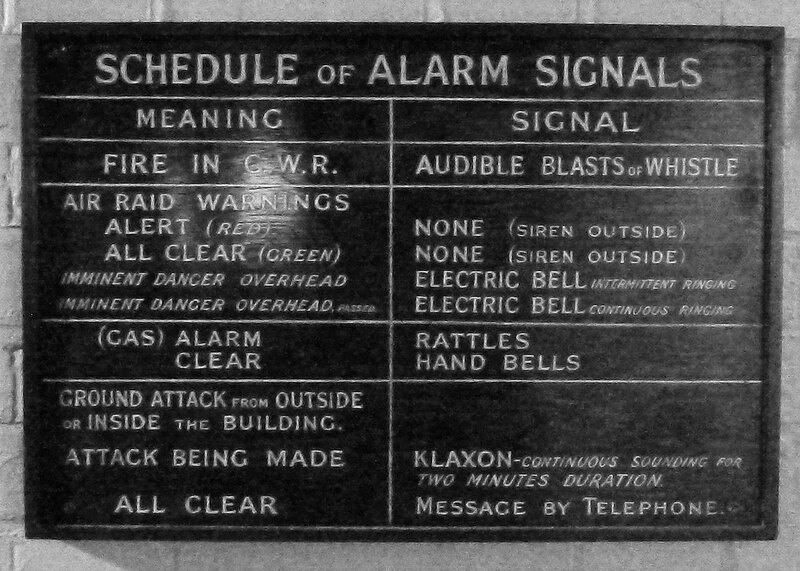 The Cabinet War Rooms remained functioning for six years. During that time, the War Cabinet met there on 115 occasions, the final time being on 28th March 1945 when the last awful V1 and V2 weapons had fallen on Britain. Churchill himself left office in July 1945, defeated in the General Election. It is said that at its peak around 300 people (one account said more than 500) – clerks, typists, serving officers, politicians – worked down the Hole as it was sometimes called. Never before have so many worked in a space designed for so few. It is astonishing that security was maintained – but these were different days, when people not only knew their place but also that careless talk really did cost lives. 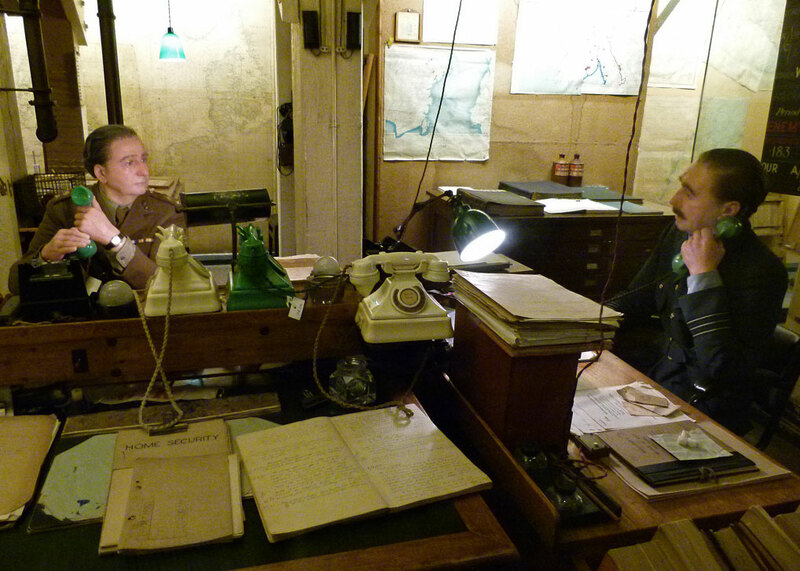 The Map Room was staffed, 24/7 as we would say today, with officers from the Army, Royal Navy and Royal Air Force. Each day, at 0800 hours, they would produce a situation report on the war for the King, George VI, Prime Minister, Churchill, and the Chiefs of Staff. 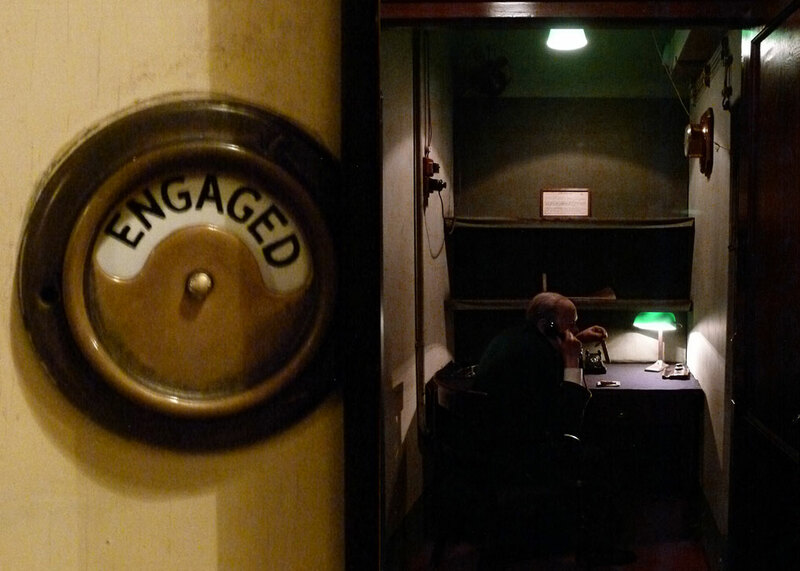 In 1943, a transatlantic telephone room was installed, in an old broom cupboard, so that Churchill and US President Roosevelt could speak directly. The charming method hit upon to disguise the real purpose of the room was to install a toilet lock on the door; so everyone thought this was the PM’s private lavatory. There wasn’t enough room for the special scrambling equipment; this was installed in an annexe basement of Selfridge’s department store on Oxford Street. There were sleeping quarters – Churchill, other key officials and Churchill’s wife, Clemmie, had their own rooms. Though Churchill is said to have only slept three nights there, he did use his room for naps. There was also a state of the art kitchen and the Prime Minister had his own dining room. Others, the rank and file, lived in another part of the complex, a labyrinth of tunnels and rooms at foundation level beneath the visitor accessible parts of the Cabinet War Rooms; it is still there, though not open to the public. Here, there were dormitories, bedrooms and eating facilities. To say that accommodation was ‘basic and without frills’ is a classic piece of British understatement. Proper drainage was impossible – a tributary of the Tyburn is said to trickle through part of it – and pumps were constantly at work. Washing and sanitary arrangements were primitive: buckets, bowls and chemical toilets mixed with the ubiquitous tobacco smoke must have helped create an arresting aroma. Many lived a troglodyte-like existence, with no exposure to sunlight for long periods, and were given access to sunlamps to reduce the risk of vitamin D deficiency. 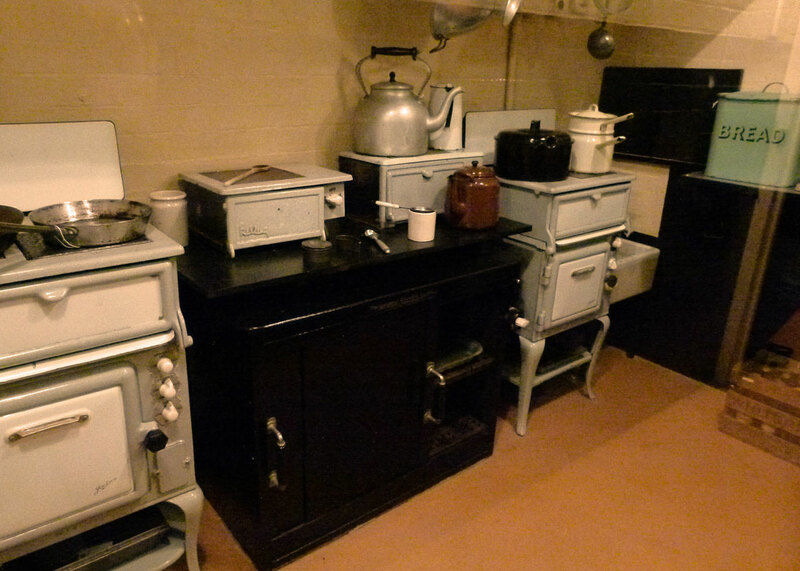 In August 1945, the Cabinet War Rooms became redundant. People went home, or onto other work. Some rooms were locked up; others were used for storage. Most of the population had no idea the complex even existed. Aside from informal insider-guided tours, it was largely abandoned and forgotten until, in the 1970s, it was decided to restore and preserve it. In 1984, the Cabinet War Rooms opened to the public. Many of the objects and furnishings on display are original. In 1980, an envelope with an officer’s name on it was found in one of the desk drawers in the Map Room. The envelope contained rationed sugar cubes and had been there since the 1940s; it is now on the officer’s desk. The clocks are set to 4.58pm in the Cabinet War Room itself; the first ever cabinet meeting held there began at 5pm on 15 October 1940. The complex also contains the unique Churchill Museum, which opened in 2005. Winston Leonard Spencer Churchill was born into an aristocratic family in 1874, the son of Conservative politician Lord Randolph Churchill (1849-1895) and the beautiful American heiress Jennie Jerome (1854-1921). He was a complex man – sometimes a bully, sometimes insecure; an imperialist and adventurer, yet also a man of the people who helped introduce social reforms that paved the way for the Welfare State. He is worshipped by many as Britain’s greatest war leader, but reviled by others who see him as an unreliable maverick, an enemy of the working-class and a shameless self-publicist. Maybe he was all of those things; but even most of his critics recognise that he was a Great Man to whom we all owe an enormous debt. 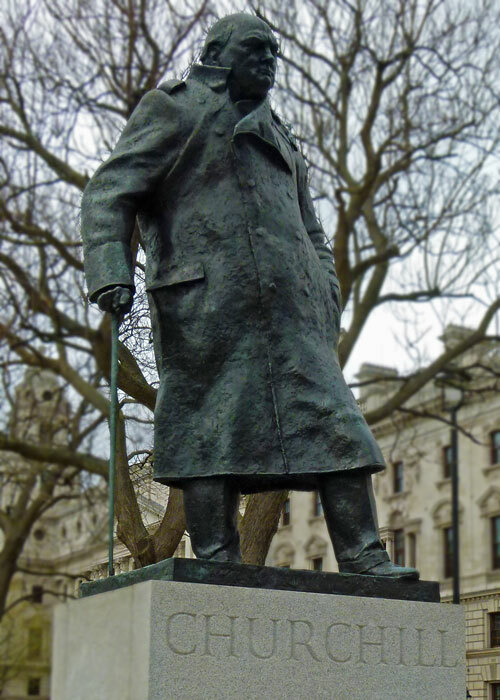 Churchill died at just after 8am on 24 January 1965 following a massive stroke. He was given the honour of a State Funeral, which took place on Saturday 30 January. At his request, he was buried in the churchyard at Bladon, Oxfordshire, near to his parents and just a mile or so from where he was born at Blenheim Palace. You can visit Churchill’s grave and his home at Chartwell, in Kent. This isn’t the first post of yours to show life-sized statues at these museums of more modern[?] history. This must be a British thing, because I don’t think we have much of this in America. And I think they would creep me out. 🙂 Otherwise, anything about Churchill is interesting to me! Thanks for the post. This is definitely on my London 2018 plan and I know I’ll be revisiting this post and many of your others later on this year. What a fascinating place. I’m so intrigued by WWII — it looks like it would be an excellent museum and experience. Let me know if you need any help planning your London trip. 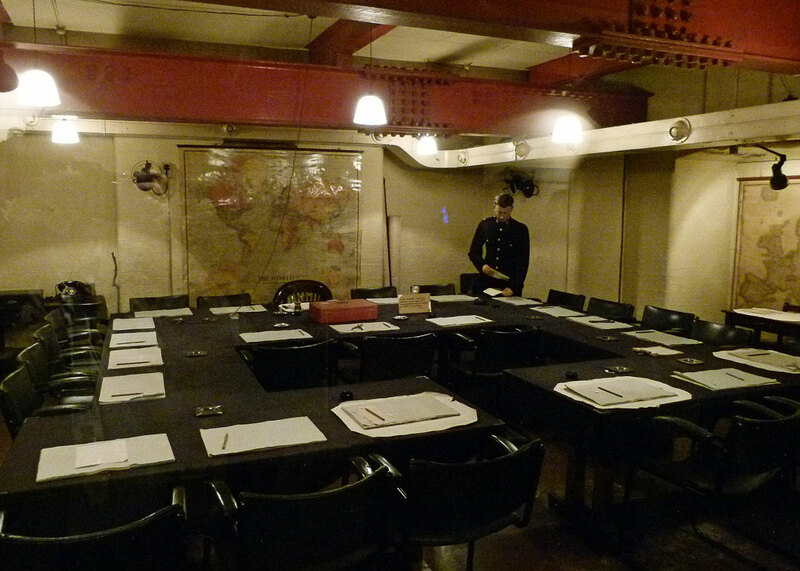 Fabulous photographs of the war rooms. It is a really interesting place to visit and your commentary does it justice. Things like this fascinate me! I’ve been on a Churchill movie watch marathon lately, and finding your post today proves that my life isn’t just a random bumping into information, but that it has a plan. I’m going to ask my friends from England if they know about these subterranean WWII rooms. I love it when I know something about their country they don’t. All due to you. Thanks. I spend my life randomly bumping into information…and I actually know people in the US who know more about Britain than many of us do! I’ve been on a Churchill movie marathon lately, so finding this post today only proves that there is a life plan for me and I’m not bumping around absorbing random facts. I’m now going to ask some of my friends from England if they know about these subterranean WWII hideouts. I love it when I can tell them something about their country that they don’t know. Thanks. We need to take a field trip!! The boys will enjoy this post. Thank you, Mike! I worked in Great George Street in the late 70’s and never knew what lay beneath me! A well illustrated and very informative post, as always, Mike. I wonder why the rooms have to be so gloomy? Perhaps cost cutting now or perhaps the rooms were gloomy then? Another interesting snippet of history. I would like to visit that war rooms and the Churchill museum. This is an excellent piece; there’s so much good information here!! I have to tell you that my in-laws visited these Cabinet War Rooms on a fairly recent trip to London. My father-in-law is fascinated with World War II, both from the American and the British perspective. He’s read several books on Winston Churchill as well. Churchill sounds like quite a study in contradiction, but I truly admire his “never surrender” attitude and feel like he was instrumental in saving the country during WWII. You’ve done a great job writing up this piece, Mike. Thanks for your visit earlier today, and I hope you and Mrs. Britain have a great weekend! Oh my word Mike, this is a wonderful post. Your comments about the nerve-centre being cobbled together and ‘make do and mend’ made me smile. My first job on leaving school was as a telephonist, and it was through that route that I joined the Civil Defence Corps, briefly before it was disbanded. I know a lot of Brits were pompous in those days, but by God they wouldn’t take no for an answer and if there wasn’t a way they found one. I have visited a ‘Secret Nuclear Bunker’ near where I live which is very interesting. Obviously it’s not secret anymore, but when it was no-one would ever know it was there. Is that a guzzunder in your 5th photo? I love the telephone room. We all have good and bad in our DNA but I do admire Churchill. A local coach company do lots of day trips, one of which is to the Cabinet War Rooms, I will be booking a trip. A ‘gazzunder’ as in something that ‘gazzunder’ the desk?! Did you spot the dolls eye switchboard – they were still in use in the early 80s, I think. I was thinking as in ‘under the bed’ ! that’s what my father called it. I have used a dolls eye switchboard. During a school trip to a Croydon theatre I sat behind Winston Churchill as we watched his actress daughter, Diana, perform. Have just looked it up in Wiki, it was As you like it. Sorry to have to show my ignorance and poor memory but it was Sarah Churchill, of course, and I’ve found the photo of the event on 11/5/61 with me behind Lady Churchill. Another fine post, Mike. Love the toilet lock. I photographed the queues for Churchill’s lying in state when I worked on the roundabout by the corner of Westminster Bridge – the St Thomas’s end. Excellent post, Mike! 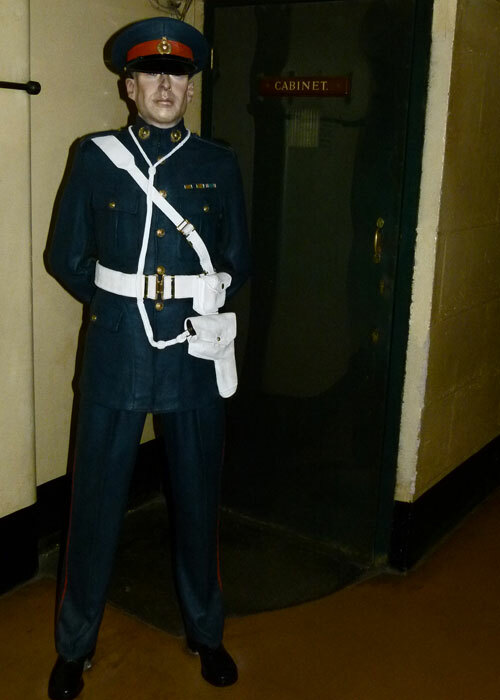 I visited the Cabinet War Rooms in 2006. It was really the highlight of my trip to London then. I was delighted to see #10 Downing Street and the Admiralty where, when Churchill became Prime Minister, they transmitted a message to the Royal Navy “Winston is back!” Thank you very much for posting this! Thanks, Louis! A signal was sent to the Fleet saying ‘Winston is back’ when Winston was appointed First Lord of the Admiralty just after the outbreak of war in 1939, because he’d held the post in WW1 too. I remember when you could just walk past No 10 – alas, you can’t now! Thanks for the tour Mike. The lack of sunshine and air must have been dreadful. However, it would be a nice place to visit if I’m ever in London. There are so many different aspects to British history – and your blog! Fascinating to learn of the accommodation for those who worked there…and the health problems from lack of daylight. One of our absolute favorite places in London, spent almost a whole day there one time. What did you think of the film “Darkest Hour”? I liked it and I know that everyone raves about the actor who portrayed Churchill but…I thought that he didn’t capture the BRILLIANCE of the man, just seemed like a grumpy old drunk most of the time! (Yes, I know he drank and I know he could be difficult but STILL…) I did like the movie though. I actually sang this on the way out: RULE Britannia- Britannia, rule the waves. BRITAIN never never never shall be SLAVES! Don’t believe me? Ask my poor husband! HA! A wonderful article! My family and I visited the secret cabinet war rooms is 2012. It was a thoroughly enjoyable experience. I saw the movie Darkest Hour with Gary Oldham and enjoyed the scenes, depicted, in the war rooms. I’m looking forward to seeing it. Thanks for dropping in and leaving a comment! Well, I think it’s reasonable to expect – even if it isn’t delivered…Do you mean WW2 took place a lifetime ago..? A fascinating place that I’d love to see for myself! It’s good that it’s been preserved like this. There is a Cold War bunker that was built here as a fall out and emergency base of operations in case of nuclear attack, west of the city. Today it too serves as a museum, this about that period in history. though in a much more pictorial manner. This would be cool to visit!